This week we've been covering various ways for the mortal man to fly. We end the week with the smoothest way to glide across the earth, at all times never more than 1 centimeter above the surface. We're talking hovercrafts. With a top speed of 30 m.p.h. 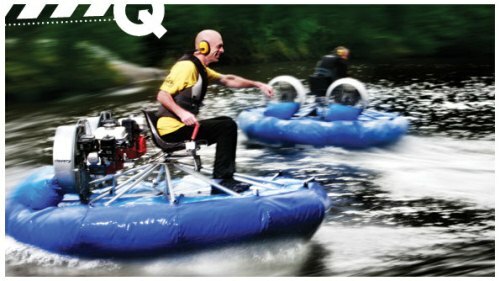 these single passenger hovercrafts can speed you from land to water and back again without ever slowing down. Be sure to see the video below. Powered by dual Hovery Bimo engines putting out 8 BHP, you'll be flying before you know it. Sessions start at 10 am, 12 pm, and 2 pm.